Last year thousands of connected devices were sold across the UK. The emergence of the smart home has given conventional home appliances a new lease of life – and home security is no exception. One area that is gaining real traction is Smart Door Locks. The desire to have all devices centrally controlled via a smartphone app is a growing trend with 52 per cent of Brits already owning some form of connected device. Big named brands such as Apple, Samsung and Google have all launched home hubs to integrate devices centrally and cater for a range of third party products. 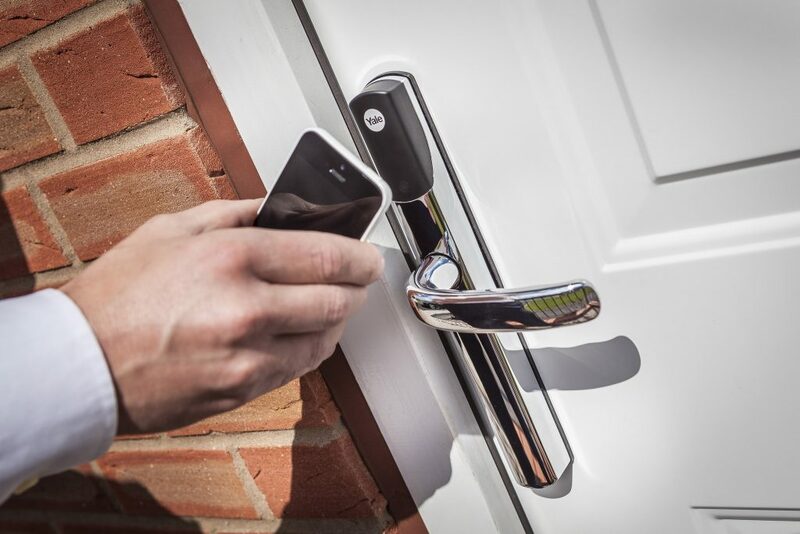 Here, we look at the trends and issues surrounding Smart Door Locks and how you can capitalise on the new revenue stream. This year, 41 per cent of homeowners said they’d like to have a Smart Door Lock in their home, citing remote access as a leading requirement. With a Smart Door Lock you can open your door in a variety of ways, including via PIN code, remote fob, key card or even your smartphone. Some devices, such as the Yale Conexis L1 Smart Door Lock, enable you to grant guests entry from anywhere in the world using mobile keys and even receive a notification when the lock is used. The past few years have been a ‘test bed’ for smart security, raising consumer awareness, fine-tuning product features, and assessing how devices will integrate and develop within a residential setting. Now that the industry has firmly found its feet, 2018 will see the Smart Door Lock market prosper. Up until fairly recently, connected door locks were perceived to be exclusively for large commercial buildings and luxury homes. However, devices are now more affordable and accessible for the everyday homeowner. This provides a new and expanding product offering that can grow substantially over the next few years. Integration will also play a pivotal role in 2018. Smart Door Locks will be developed with standalone functionality, as well as having the ability to connect to a larger smart home system. This means that homeowners can adopt the technology at their own pace, and don’t necessarily have to invest large sums into a full smart home system from the word go. This provides trade professionals with repeat business opportunities to increase add on sales. Fortunately for builders, professional installation is a leading requirement for smart technology. Consumers increasingly want devices professionally fitted, with 33 per cent opting for a tradesman, rather than taking on the project themselves. This is because homeowners feel unfamiliar with the new technology and want added peace of mind that the devices have been fitted correctly. This offers significant opportunities for a wide range of tradespeople who can be more involved in fitting Smart Door Locks. Additionally, as it’s a new industry, customers want a brand name they can trust. As the leading company in the home security field, homeowners recognise Yale’s famous yellow circle, and as a result, this boosts customer confidence, providing instant reassurance that the products are reliable. The Yale Conexis L1 Smart Door Lock is no exception and has undergone rigorous testing to prove it’s anything but standard. Not only is it protected with a two-year product guarantee but is has also achieved PAS24 certification when used as part of a door assembly with other appropriate hardware. Smart door locks and smart home security as a whole also lends itself to seasonal promotions. The time to start selling is now, as typically the winter months are the best time of year for people buying security actively, rather than reactively. What’s more, thanks to remote access features and the ability to check on a property when you’re away, these connected devices are also experiencing an increase in demand during the summer months. This is because homeowners increasingly want added convenience and the peace of mind of knowing their home is secure when they are out or on holiday. This again is a great opportunity to promote smart security solutions during a typically slower sales period.